Wittenberg, Delony & Davidson Inc. Mid America Science Museum at the Donald W. Reynolds Center (MASM) is a science museum that was originally built in 1979 as one of the first interactive science centers in the country. Located in Hot Springs, Arkansas, MASM is a statewide attraction for families, students, educators and tourists. The challenge was to create a unique visitor experience that utilized the museum's natural wooded context & existing facility, while reinforcing science education through hands on learning and adventure play. The science skywalk is designed to project visitors into the landscape and engage the natural setting of the wooded site, while creating points of interest along the skywalk path for hands on science exhibits. 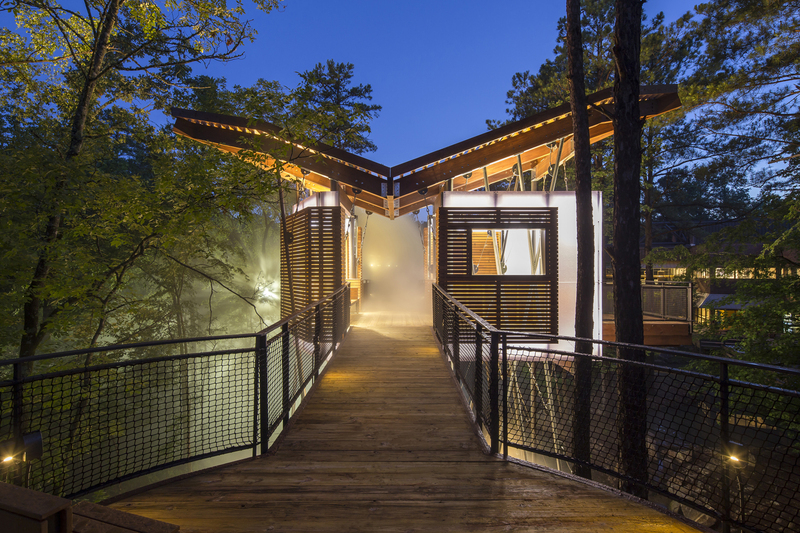 Partially hidden from the main museum building, the science skywalk & tree-house icon exudes a mysterious quality, due in part to a periodic fog that is created along its primary bridge entrance. The series of bridges and ramps change levels and provide unique tree-top observation platforms along the elevated walkway. The primary focal point of the circular platforms is the very popular circular cargo net. This circular net spans over the creek below and is totally accessible from the lower platform. Perfect for sky-watching or hanging out on. The skywalk platform is 32 feet above the creek at this point with a V-bridge that connects the upper level to the lower level platform for a more adventurous outdoor experience. The primary materials used on the skywalk blend in with the natural setting; cedar slats, weathering steel columns, heavy timber framing and rope netting. In contrast, the tree-house icon is a white back-lit acrylic box with steel bracing within this cedar lined interior that houses the musical bench and an observation deck cantilevered out over the creek below. The science museum's interior has been renovated to create newly themed science gallery spaces with over 100 new custom exhibits. The design goal for the interior was to start the visitors museum experience upon arrival and create an atmosphere of learning through engaging activities, hands on exhibits, experiments and even some unexpected outcomes. Some of the galleries and features on the interior include; a new Entrance Lobby, (Admissions Desk and Gift Shop) and new galleries: Motion Gallery, Light & Optics Bridge, Water & Fluids Gallery, Arkansas Underfoot Gallery, a 50 person Digital Dome, Tesla Theater, Work Shops and the Tinkering Studio.